The game revolves around Francis Vendetti, a folk singer who is the nephew of folk music legend, and his journey in creating a new on-stage persona one night before his first concert. With the help of Violetta, a laser artist from California, they go on a multi-dimensional journey to find out who he isn’t. Let’s get this out of the way first – the soundtrack on this game is pretty awesome. It does help that the team features some big names from the music industry – Jonny Galvatron, the lead singer of indie band, the Galvatrons; and Josh Abrahams, known for composing the soundtrack of Moulin Rouge. As expected, much of the game mechanics revolve around music – more specifically, the guitar. 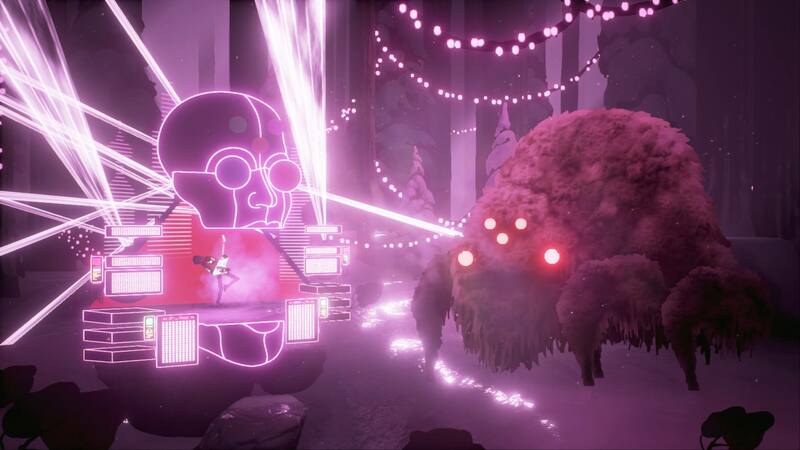 In the demo featured at PAX Australia, in order to get to the other side, you had to ride on a laser beam while playing with the guitar. In addition, some of the challenges require you to play alongside a creature (similar to Simon Says) in order to continue on your journey. The visuals are outstanding as well – you get a sense that you are wandering through a multi-dimensional fantasy world. While the game only showed us only one level, I can’t wait to see how the other worlds look (and sound) like. The game does not have a release date. While the developers were unsuccessful in having their funded through Kickstarter, it’s great to see they have continued to develop the game. Speaking to one of the members of the team, they will be investigating if they will get some funding from Film Victoria (after they heard about such funding on Friday). And I hope they do – because the Artful Escape of Francis Vendetti is excellent as art and as a game.